Initially this book was conceived as a mere commemorative publication for Remo Bernasconi – but it has become much more than that. I fear the most readers would have expected a bunch of idiosyncratic adulations for Remo Berlasconi from a commemorative publication; please feel comfort, this book is no “Festschrift” in a classical (and deterring) way. It will make you familiar with the thoughts and the spheres of interest that drive Remo Bernasconi and produce some new points of view to the actual subject: Addiction. 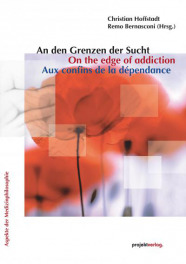 But why “on the edge of addiction”? Because we assembled authors that work at the margins of this research area – in a positive, Derridean way: Only through interdisciplinarity, lateral thinking and creative approaches we can really understand phenomena like “addiction” – and the trilingualism* will add to the idea of opening new aspects and seeing phenomena from another cultural background. To be honest: We are addicted to philosophy and dealing with ideas is our passion. We are glad to have finished this project – but at the same time we are looking forward to the moment when this book finds its way to the readers, initializing new possibilities for discussions and new projects. On a personal level, maybe this is the philosopher’s addiction, the vicious circle of thinking. One thing ends and the next begins.